It was 10 years ago today, December 30, 2001, that I stepped on stage at Hagerman Baptist Church in Sherman, TX and led my first worship service as a full-time minister. I had just finished my coursework at Hannibal-LaGrange College (now University) in Hannibal, MO and accepted the Minister of Music position at Hagerman. I was grateful that a church would take a chance on a recent college graduate with very little experience. I was also glad to be in Texas as that put me in the same state as my girlfriend Erin! It has been a crazy 10 years full of ups and downs. I have met some amazing people along the way who have become lifelong friends and mentors. I have crazy stories to tell that can only be described as fiction which one day may find their way into a book. However, the best thing about my 10 years in ministry is that I have seen hundreds of lives changed for eternity. It doesn't get any better than that! Below is look back at some personal and professional highlights of the past 10 years. - The staff at Hagerman (Shawn Kemp, Tim Medley, Linda Ballard, Brick James) became my friends and displayed much grace as I began in ministry. I could not have asked for a better group to work with. I owe much of my success to that staff and church. - I started coursework in 2002 at Southwestern Baptist Theological Seminary. 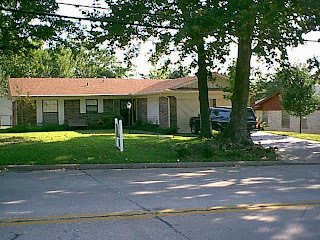 - Erin and I bought our 1st house in Denison, TX in Feb. 2003. I had 3 months to remodel a house stuck in the 1970's before our May wedding date. I don't think Erin would have moved in with me if I had not removed the shag carpet and "wood" paneling on the walls. I got it fixed up in time and we started our married life together in the house on Crawford Street. - One of my biggest ministry highlights at Hagerman was starting the Hagerman Music Academy where we gave lessons to individuals in the areas of voice, percussion, and piano. It is always a thrill to unlock potential and then assist someone in using their talents for God. - In late 2004 we moved to Arlington, TX where Erin accepted a volleyball coaching position at Martin High School. This allowed me to be closer in proximity to SWBTS to attend full-time. I was hired as the Worship Pastor at Longbranch Community Baptist Church where I eventually became the Associate Pastor (worship, students, & education). - On May 7, 2006 we welcomed Anderson Monroe Franklin into our lives. - In 2007 we moved to Austin, TX where I served as Worship Pastor at Anderson Mill Baptist Church. On May 28, 2008 we welcomed Evan Jackson (EJ) Franklin into our lives. - Transition AMBC from a blended service to two distinct services: “The Country Gospel” (music from Johnny Cash, Hank Williams, hymnals from the 1800’s and early 1900’s, etc.) and “The Modern” (music from Matt Redman, Hillsong United, Chris Tomlin, Lincoln Brewster, Tim Hughes, etc.). - Brought unique concerts to AMBC to create outreach opportunities. Artists include Todd Agnew, Lecrae, MikesChair, Laura Story, Matt Brouwer, Danny Brooks, plus many others. - Create a Songwriter’s Circle to craft songs with other writers for use in worship services. - Develop a Host Team Ministry to create positive first impressions among guests and to offer assistance to anyone desiring help. - In 2010 we moved across the country to Green Bay, Wisconsin for me to serve as the Worship Pastor at Spring Lake Church. After living in the warm climate of Texas for almost 10 years the shock of winter hit us pretty hard. However, we survived our 1st winter and are now ready for the 2nd!